Long Island Crisis Center To Hold 6th Annual "Let's Walk, Let's Talk...Stepping Together To Prevent Suicide" On September 21st. Update - September 19, 2014 - There has been a slight location change. The walk will take place at the Long Beach Boardwalk at the field between Riverside Blvd. & Long Beach Rd. 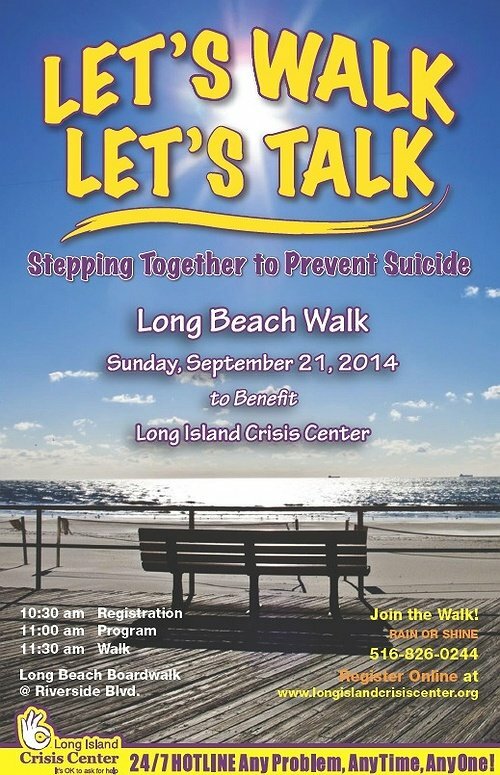 Bellmore, NY - September 3rd, 2014 - Long Island Crisis Center (LICC) will hold its 6th Let’s Talk...Stepping Together to Prevent Suicide” event on Sunday, September 21st Riverside Blvd. in Long Beach. The Walk will be a culminating event on Long Island recognizing September as National Suicide Prevention Month. On-site registration for the Walk begins at 10:30 a.m. Online registration is taking place right here or call 516-826-0244 for more information. A minimum donation of $25 per person is suggested. Long Island Crisis Center is a not-for-profit, 501(c)(3) agency that operates its staffed hotlines 24 hours-a-day, 7 days-a-week. Counseling is also available through: an online chat; texting “LICC” to 839863; and walk-in services (9:00 a.m. to 9:00 p.m.) at 2740 Martin Ave., Bellmore, N.Y. All services are free, anonymous and confidential. Subject: LongIsland.com - Your Name sent you Article details of "Long Island Crisis Center To Hold 6th Annual Suicide Prevention Walk"